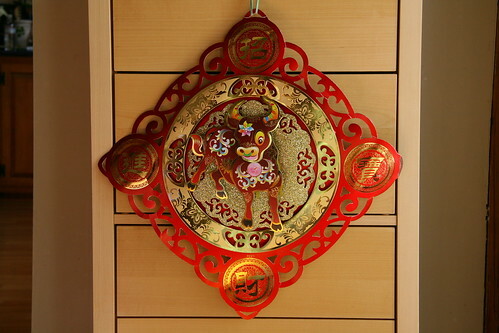 This is a red decoration of a cute ox that my mother gave me for Chinese New Year to decorate my home. I know that you should decorate your house in red papers for Chinese New Year, but when do you get to take them down? Since the Chinese are steeped in tradition and superstition for everything, I decided to consult the internets for the answer. I found this site which describes all the days leading up to and following the Chinese New Year. There are no less than 15 days of various celebrations after Chinese New Year! The funniest one is the 12th day of the Chinese New Year Festival - The Diarrhea Day: "Many people keep eating with greasy food from Chinese New Year Eve for 11 days. They might have a trouble for diarrhea on this day...."
The last event is the Lantern Festival on the 15th day, which was February 9th this year. Since we are well past that, I'm probably clear to take it down now! I know this blog post is many years old now, but you have helped me very much! This has been out 3rd year celebrating Chinese New Year and I always guessed and just took them down a month after CNY.